For the past three years, Martnaham Loch has been the site of a long staying drake Smew during the winter months. However, last year we were fortunate enough to be visited by a redhead Smew before the drake, unfortunately it did not stay, which at the time we thought was a shame. Having a pair of Smew on a loch, well who knows what could have happened! The drake Smew subsequently appeared and stayed the whole winter. At the start of this winter we had high expectations for the return of the drake and maybe even the redhead. Checking last year’s notes we predicted that the redhead may appear early to mid November, while the drake usually appeared a month or so later. As if following a carefully laid out plan, the first sighting of the redhead was on the 9th November, would it stay long enough to be attracted by the drake to partner him for the winter? Whilst numerous texts, such as Madge and Burn (1988) , Beaman and Madge (1998) , Ogilvie and Young (1998) and Snow and Perrins (1998) , show both male and female adult and occasionally juvenile plumage, none show the transition of moult from male eclipse to full breeding plumage. The following are such observations of a drake Smew in moult. The flanks were a dirty white, mixed with grey. An afternoon visit on the 26th November provided a view of the Smew but in poor light. However, something did not seem right with it. With a cursory look you would say that it was the redhead, however, on closer inspection the chestnut brown crown appeared to be split down the middle by an intrusion of white. The wings also appeared to be showing more white than previously, though their appearance gave the impression of a ‘messy’ plumage rather than any developing pattern. The previously grey chest and dark brown sides were less bold in their colour and showed a white vermiculated pattern coming through. This, of course, raised suspicion that this redhead Smew, presumed female, was in fact a male in eclipse, or a first year male coming into breeding plumage (see figure 2). This was confirmed by a visit three days later, on the 29th, when after an initial scan of the loch the Smew was eventually spotted, but what a difference. No longer could it be mistaken for a redhead now, it had the distinctive drake look about it. Though not in full breeding plumage, the chestnut brown head had all but disappeared leaving a faint hint of brown on the forehead and a faint brown band extending around the back of the head from the black eye patch. There was more white appearing on the wing, now becoming more recognisable as the white patch on the scapular and coverts. The chest was a lot paler than in the previous visit with white being the dominant colour and a residue of grey and brown forming the vermiculated pattern (see figure 3). Subsequent visits saw the eclipse moult slowly vanish and the breeding plumage come to the fore (see figures 4 and 5). A visit on the 12th December saw the drake in his full resplendent glory showing the distinctive white with delicate black lines traced across his body (see figure 6). As to whether this was a first year bird or an adult in eclipse is a matter of debate. However, the fact that last year we had a redhead which disappeared, only to be replaced by a drake a week later suggests that it may have been the same bird. This could mean that it was a second year breeding bird, though Martnaham has had a Smew for three winters now. The first winter 1999/2000 saw its arrival later and its stay shorter, which could indicate that it was a first year breeding bird then. Or perhaps Martnaham is simply a Mecca for visiting Smew! According to Blake (1993) Smew undergo a complete post-breeding moult, into eclipse, from mid-June to September. They moult their flight feathers simultaneously from mid-July to late September, during which they are flightless for about one month. A partial pre-breeding moult, from eclipse into the more familiar breeding plumage, starts when the wing is fully grown. This usually occurs from September to November. This male would appear to be quite late in starting its pre-breeding partial moult. It is unknown whether the lateness of the pre-breeding partial moult is a common occurrence among Smew within the British Isles, as they have the furthest distance to travel, due to the British Isles being at the Western limit for Smew migration ( Cramp 1998 ). In this case observation has shown that pre-breeding partial moult affects the head, breast, sides and upper-wing coverts. The previously grey chest and dark brown sides were less bold in their colour and showed a white vermiculated pattern coming through. The chest was a lot paler than in the previous visit with white being the dominant colour and a residue of grey and brown forming the vermiculated pattern. The broad greyish downward strip was visible in line with the shoulder. The wing coverts bar had grown considerably, although was still a dirty greyish/white. The drake was in near complete partial pre-breeding moult showing the distinctive white with delicate black lines traced across his body. The classic drake Smew in its unmistakable breeding plumage is a good example of a bird that takes the focus away from its other plumage’s. This, allied with the fact that they are a latish winter visitor which we would normally have expected to have moulted prior to arrival, leaves many of us with the assumption that every redhead is a female, but as shown here this is not always the case. Clearly the arrival of early redheads warrants greater scrutiny, as they could just be a glorious drake in waiting. Identification Guide to European Non-Passerines, BTO Guide 24. The Handbook of Bird Identification for Europe and the Western Palaearctic, Christopher Helm. The Complete Birds of the Western Palaearctic, CDROM, Oxford University Press. Wildfowl: An Identification Guide, Christopher Helm. Wildfowl of the World, New Holland. The Birds of the Western Palaearctic (Concise Edition), Volume 1: Non-Passerines, Oxford University Press. This article originally appeared in Ayrshire Bird Report 2001 and Birding Scotland, 5(1), 29 – 32, January 2002 , and is reproduced here with kind permission of the respective Editors. This entry was posted in Articles on 28-Jan-2002 . It is now ten years since the rats on Ailsa Craig were completely eradicated. In this article I cover the background to rats arriving on the island, how they were eliminated and some of the subsequent changes following their demise. Both the Brown Rat and the Black Rat are introduced species to most of Europe. The Black Rat arrived in the British Isles via the ancient trade routes from South East Asia probably around the eleventh century; the Brown Rat arrived much later, around the year 1728, via shipping from present day Russia (Corbet and Southern, 1977). While the Black Rat has largely died out over much of its former range in northern Europe, the Brown Rat has spread, sometimes ousting the Black Rat in the process. In Scotland, the Brown Rat spread rather slowly, and by 1855 was described as “recently introduced” in some remote areas (Matheson, 1962). The Brown Rat has now spread over virtually all of the Scottish mainland and, through the agency of man, to many islands, large and small. Their ability to survive and their impact on island ecosystems has until recently been little studied. The dynamics of rat populations can be of the “boom and bust” type; numbers increase then crash when food ceases to be available, but they never die out completely and their numbers can rapidly build. We tend to think that much attention has been focused on the problems of seabird islands and rats within the past 15 years, but it is not a recent phenomenon. In 1889 a dog belonging to one of the lighthouse keepers on Ailsa Craig killed a Brown Rat at the head of the jetty (Campbell, 1892). It was the first seen on the island. At the time a ship delivering coal was at the jetty supplying the recently built lighthouse with coal for conversion to gas for fuelling the light, (a practice which ceased around 1910, when the light was converted to paraffin). This was certainly the first rat recorded on Ailsa Craig, an island that had been inhabited, albeit seasonally, since at least the 12th century. Lawson (1895) had noted the absence of rats in the first edition (1888) of his book on the island’s natural history, but by the second edition commented on their abundance. Several large ships came to grief on the rocks and reefs surrounding Ailsa Craig in the latter part of the last century and probably added to the rat invasion. Major catastrophes included the Duke of Edinburgh in 1870, the Clan Campbell in 1881, the Austria in 1884 and the Pennon in 1889 (Crawford, 1988). Rats had only to swim ashore from any of the wrecked vessels to find probably a better food supply than that on board ship. Following the first two of these wrecks, which involved loss of life, the Commissioners of the Northern Lighthouses were petitioned, resulting in the construction of the Ailsa Light in 1883. The light became operational in 1886. The rats had clearly spread from below the cliffs and around the houses to occupy all habitats on the island, “They are all over the island, from the very top down to the water’s edge” This situation remained until 1991. Campbell summed up his comments by concluding – “It is difficult, if not impossible, to suggest a cure but if any such can be found there is no more favourable spot on which to operate, for the Craig – cannot, unless by a chance similar to their introduction – receive any outside accession to their numbers.” Apart from eating the young and eggs of most seabirds, the rats would also have found the many Northern Gannet carcasses below the cliffs a favourable food source. These are adult and young birds that have died from falling. Adult Northern Gannets do so when fighting and young of all ages fall when adults knock them off accidentally or, when larger, during wing exercising in windy weather. 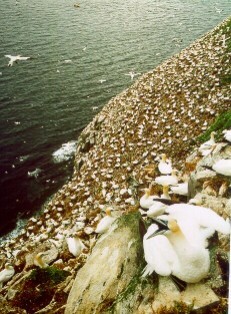 Wanless (1983) estimated over 600 Northern Gannets, young and old, dying in the course of a season below the cliffs. The Atlantic Puffin colony on Ailsa Craig, formerly described as in “bewildering numbers… so great that they darkened the sky” (Gray, 1871), had been so ravaged by rats that by 1934 their numbers were few, McWilliam (1936) described them then as “practically extinct”. Burrow nesting seabirds such as Atlantic Puffins and petrels are very susceptible to rat predation. One of the major benefits from nesting in burrows is generally held to be the avoidance of predators, usually avian. Often this means that both adults can temporarily abandon the young chick and go to sea; this makes the young particularly vulnerable to rat predation. In contrast, surface nesting petrels such as the Northern Fulmar, which probably descended from a burrow- nesting ancestor, will routinely attend the chick for around 10 days after hatching before leaving it during foraging trips. By this age the oil capacity of the chick has developed enough to act as a defensive or offensive form of protection. Chicks either in burrows or unattended on the surface are therefore vulnerable to rat predation. However no major steps were taken against the rats on Ailsa Craig until 35 years after they were first seen on the island. 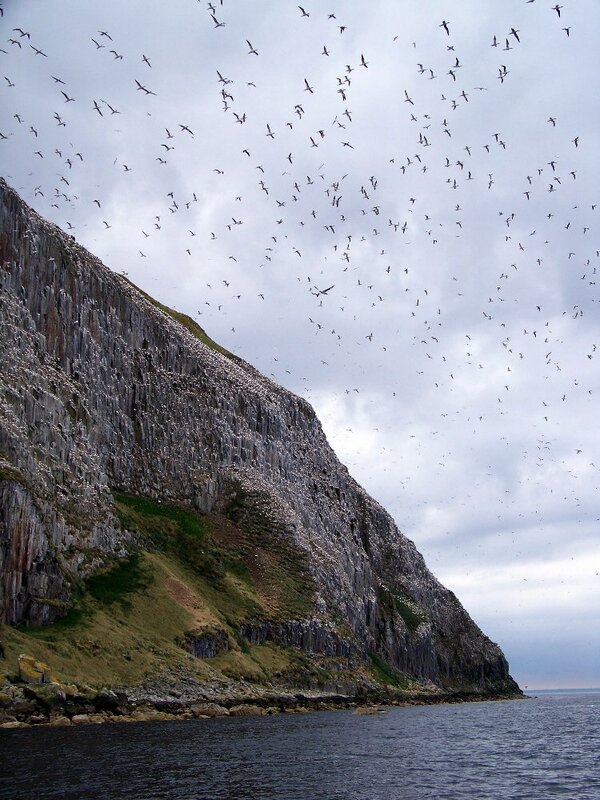 The invasion of Ailsa Craig by Brown Rats, and the damage they caused, prompted perhaps the first-ever attempt at rat control on a seabird island anywhere in the world. With the growing awareness of the value of conservation, and the passing of Acts of Parliament to protect wildlife, Glasgow members of the then embryonic Royal Society for the Protection of Birds took up the gauntlet thrown down during a Parliamentary session in 1924. Questions were asked in the House of Commons as to what could be done to save the Ailsa seabirds from rats (Anon., 1924). This bold step stimulated concerned individuals into action. The then not inconsiderable sum of £160.00 was spent on rat poison for the effort in rat eradication by the Glasgow branch of the Royal Society for the Protection of Birds (RSPB, 1924 and 1925). The money and effort helped reduce the numbers of rats on the island considerably. The poison used however (Ratolin) was not wholly effective. Many, but by no means all, rats were killed, (RSPB, 1925) and those surviving slowly increased their numbers once more. Detailed studies undertaken during 1989 and 1990 of the breeding success of seabirds on Ailsa Craig showed that Northern Fulmars and Gulls in particular appeared to suffer heavy losses at the egg and chick stage. Many Northern Fulmar eggs went missing and all hatched chicks were similarly lost. Reasons for the failure of Fulmars to raise young to the fledging stage at most Clyde colonies were not that obvious. Since the circa 300 pairs of Northern Fulmars on Sanda Island, off the Mull of Kintyre and 25 km distant from Ailsa, were capable of regularly raising young to the fledging stage, (Clyde Ringing Group data), it suggests that the Fulmars were experiencing land-based rather than sea-based difficulties. Sanda Island has neither rats nor rabbits, and also has breeding Manx Shearwaters, Storm Petrels, Black Guillemots and Atlantic Puffins – all burrow-nesters. Habitat on several of the smaller Clyde islands appears perfect for burrow-nesting species, although only a very few have them present. Gull chicks simply vanished from around the nest sites. These were usually less than 14 days old and a few part-eaten corpses under boulders showed gnaw marks to legs and cranium, with most tissue in between these areas removed completely. In 1989, 72 monitored Herring Gull clutches, comprising 194 eggs, produced only 11 fledged young. Gull chicks are precocious, brooded for only a few days after hatching and then are able to shelter from heat and rain by going under rocks and boulders, usually within a few metres of the nest. Adult Herring Gulls attend the chicks by day but at night when chicks were under rocks or in holes these would be vulnerable to rats, even with the adult close by. From around 2000 pairs of breeding gulls on the island the pre- dispersal, post-fledging roost sites on the island in 1989 and 1990 showed around 300 juvenile birds when perhaps three times that number could reasonably be expected. Following preliminary discussions between interested parties it was agreed that complete rat eradication, if possible, would be of benefit to the seabirds and the island in general. The Ailsa Craig Working Group was therefore formed in November 1989 to investigate and oversee a proposed rat eradication project. It comprised the island’s owner, The Most Hon. The Marquess of Ailsa, O.B.E., Prof. Pat Monaghan (Glasgow University), John Burlison (Scottish Natural Heritage), Donald Smith (Clyde Ringing Group), Geoff Hancock (Kelvingrove Museum), George Houston (Rentokil Ltd), and the author Bernard Zonfrillo (Glasgow University). In 1991, 3 tonnes of Warfarin rodenticide was deployed and this was followed by 2+ tonnes in 1992 as a precautionary back-up measure. Warfarin was airlifted to the island in winter and the bags dropped at pre-determined zones on the upper slopes. Without the voluntary help from the Royal Navy Sea King helicopters of 819 Search and Rescue Squadron at HMS Gannet, Prestwick, the entire success of the project would have been in doubt. Bait was stored under tarpaulins until ready for use. Poison was placed, wherever possible, well under rocks or deep in holes to avoid easy access by non-target species. The species thought most vulnerable to the effects of secondary poisoning, e.g. gulls and Common Raven were monitored for breeding success. Bait- boxes, made of timber, were used in areas where rat activity was noted but where no suitable cover for bait laying could be found. It was essential to devise a rat monitoring programme for both before and after baiting had taken place. Before baiting, hundreds of chewsticks (wooden spatulas saturated with margarine or lard that are chewed and bitten by rats) were set around the island and checked or replaced daily during October 1990 and March 1991. This showed where rats were active, since almost every chewstick had been chewed. Two weeks after baiting was finally completed, in mid April 1991, some 600 chewsticks smeared with rancid margarine had been set around the base of the island, on the upper slopes, on the accessible seabird ledges and monitored. The chewsticks showed no rats active following the initial and subsequent baiting. And after three further years of constant monitoring the situation remained the same. Monitoring also included the breeding success of seabirds previously preyed upon by rats and the overall success of species such as large gulls was estimated from the numbers of chicks fledging. Most rats appeared to die underground, only 4 were found dead above ground post-baiting, lessening further any possible risk of secondary poisoning to non-target species. The last live rat seen on Ailsa Craig was on 15 April 1991, near the summit. Of the other animals indigenous to the island the reptiles, Common Lizard and Slow Worm, and mammal, Pygmy Shrew, were not thought vulnerable to the poison, being almost exclusively insectivores. Rabbits however were thought vulnerable, but expendable, being a deliberate introduction of man and generally damaging to the island by destroying vegetation and precipitating soil erosion. Evidence showed after baiting that rabbits had been considerably reduced by the effects of Warfarin set for rats. Great Black-backed Gulls fed on young and adult rabbits but in two years of study there were no obvious effects to either the adult birds or their offspring. Indeed the breeding Great Black- backed Gull numbers increased, probably because rats had been eliminated from the competition in scavenging of bird corpses. The Warfarin uptake by rabbits was evident in the droppings that changed colour due to the inbuilt dye. But unlike rats, many rabbits did not take the poison. Evidence of rats, or the lack of them, was monitored by as many means as possible to assess the success of the project. Categories of evidence fell into two main forms – positive and negative. Negative monitoring (i.e. absence of an effect), showed no chewsticks chewed, no bird carcasses gnawed, no fresh rat droppings anywhere searched, bait uneaten in bait boxes and no sighting of rats by day or night. In April 1989 a fresh dead Northern Gannet was laid out under the south cliffs (under a large flat rock to prevent gulls scavenging). In two days it had been opened by rats, in 5 days most flesh from legs, feet, pectoral muscle and head had gone and by 12 days all that remained was cleaned bones and feathers. In April 1991 the exercise was repeated and another fresh Northern Gannet carcass was laid out in the same area shortly after baiting. This was monitored daily for 3 weeks and no sign of rat activity was found. Regular weekly monitoring thereafter showed that by June 1991 the corpse had effectively mummified, being completely intact. There were few other carcasses in the area available for scavenging at that time and it was a strong indication that baiting had been effective. Of circa 800 Northern Gannet corpses checked over the next two years, none showed chew marks to feet or elsewhere. Positive monitoring (i.e. increased productivity of plants and animals), for evidence of rats commenced almost immediately after the spring baiting of 1991, when the first seabird eggs were laid. In general vegetation became more luxuriant, due to the elimination of rats and rabbits (Zonfrillo, 1994). For rare plant species such as the Tree Mallow, the seed heads of which had suffered from rat activity, no immediate effect was noticeable, since it is a biennial. However in 1991 and 1992 its cliff-site plants produced abundant seed and much of the area below the cliffs had by 1993 many new Tree Mallow plants emerging. The Sea Radish, also largely confined to cliff sites, spread and provided a dense growth, beneficial to insects and caterpillars. This Brassica is a major food source for many butterfly and moth species. The vegetation on the ledges also grew more robustly and many Northern Fulmar sites formerly exposed to gulls were sheltered by the new vegetation growth. Following the first baiting in 1991, the majority of species apparently affected by rat predation raised young to the fledging stage. The numbers of successful gull nests were estimated from the numbers of young assembling at pre-dispersal, post-fledging roost sites around the island. The peak counts of young gulls before and after rat eradication show a rapid improvement in fledging success rate. The Herring gull population was estimated to be stable during this period, but the Lesser Black-backed Gulls showed a marked decline in breeding numbers. Despite the latter, the overall numbers of young gulls showed a vast increase with peaks of up to 1200 fledglings counted. The Northern Fulmars that hatched young also showed a remarkable improvement going from 100% failure to 100% success, perhaps best demonstrating the absence of rats. Since baiting commenced in 1991, three burrow-nesting bird species have colonised Ailsa Craig. Two were frequently seen around the island in past years, but never recorded breeding. These were Black Guillemot and Shelduck. Both were discovered on eggs in summer 1991 and bred successfully (Zonfrillo & Nogales 1992). The third species was Wheatear, a frequent passage migrant but again, never proven to have bred on Ailsa. All three species have continued to breed successfully since colonising the island and Black Guillemots now stand at around 8 pairs. The Atlantic Puffin, which had formerly bred in vast numbers on Ailsa, also made a re- appearance. One was seen ashore entering a suitable cliff crevice in 1991. Unfortunately it came to nothing. In 1992 none was ashore but at sea numbers of prospecting birds in groups of 5 or 6 were evident just offshore. In 1993 a peak of 19 together was recorded and up to 22 seen together in 1999. The process of re-colonisation of Ailsa Craig by Atlantic Puffins appears to have commenced but it will clearly be slow. During June 1991 two dead Manx Shearwaters were found on the island, again a species frequent offshore but with no history of ever having bred on Ailsa Craig. This nocturnal species has prospected the island for many years, as calls have been heard most calm nights during July and August. The two dead birds ashore, strongly suggested a serious breeding attempt and further nocturnal calling in spring 1998 may have indicated burrow occupiers if not breeders. During the past few years European Shags have colonised the boulder beaches below the Gannetry and up to 25 pairs raised young in 2000. At one location for the first time ever, a single Razorbill was incubating a newly hatched chick under the boulders, with six birds sitting around nearby. If these ground-nesting Razorbills increase then Atlantic Puffins may follow their lead. The other species thought vulnerable to the secondary effects of Warfarin poisoning proved to have fared well. Common Ravens raised normal broods of 4-5 young during 1991-1993, showing no obvious effects through brood size reduction from secondary poisoning. This project has shown that even in the most difficult terrain such as on Ailsa Craig, large populations of alien Brown Rats can, at the very least, be rapidly reduced. An inexpensive but highly effective method of monitoring rat activity (or presumed absence) is available through the use of chewsticks. The breeding success for vulnerable seabird species will show a rapid response, given that sea-based factors such as prey abundance and availability remain substantially unchanged. Monitoring before and after baiting is essential and can be summarised by negative and positive indicators. Negative monitoring was the absence of effects formerly evident e.g. a lack of chew marks on the chewsticks, a lack of gnaw marks on bird carcasses, a lack of fresh rat droppings, a lack of uptake of poison bait and a lack of physical sightings. Positive monitoring included the increase and improvement in parameters formerly held low by activity of rats. It included breeding success of birds formerly eaten by rats, colonisation or re- colonisation of the island by burrow nesting bird species, recovery and growth of vegetation, particularly in areas where rats were causing destruction. Also monitored were the effects on populations of other vertebrates and invertebrates through improved habitat quality and exploitation of available carcasses by scavenging bird species. It was particularly noticeable that scavenging of bird carcasses by rats quickly ceased. Gull- scavenged corpses of seabirds and rabbits usually finish with the skin exposed i.e. inside-out and with feet always intact. Rats were capable of killing Northern Fulmar chicks of over 1 kg in weight and probably the live, unguarded young of all species under that weight are potentially vulnerable to rat predation. Adult birds of all but the smallest species are probably immune to rat predation unless in exceptional circumstances. The late autumn die-off of fallen and injured young Northern Gannets would have meant an abundance of meat and fat for any surviving rats and a rapid increase in their numbers. The basal areas of Ailsa Craig were particularly well-monitored and no evidence of such activity was found. Modern poisons and methods of bait distribution and post-kill monitoring also heightens the prospect of a successful outcome. It is therefore essential to monitor both before and after baiting takes place. While elimination of rats from islands has immense conservation value, legislation is probably required to ensure that shipping is constantly checked for rat infestations. At present there does not appear to be any such compulsory activity undertaken. Rats join ships of all sizes mainly at ports and docks by climbing mooring ropes. Compulsory rope guards (cones or other devices) should be enforced to ensure anti-rat precautions are taken at source. Under Economic Community Wild Bird Directives, many seabird species require to be conserved and protected and this must be taken seriously. The model from this study shows that rat numbers can be quickly decimated, vegetation will improve, breeding success of vulnerable species changes rapidly, lost or absent species vulnerable to rat predation will colonise under suitable conditions and adequate monitoring methods will ascertain evidence of rats, or the lack of them. The ecosystem will in essence return to “normality”. The methods and materials are now available for the execution of such a programme to conserve important island fauna and flora. Ecosystems will re-generate rapidly when alien predators and grazing pressures are removed. Lizards, Slow Worms and Pygmy Shrews all became more frequently sighted on Ailsa Craig following the elimination of rats, suggesting competition or predation was previously constraining their numbers. From initial baiting in spring 1991 until regular monthly monitoring for rats ceased in October 1995, no evidence of rats persisting on Ailsa Craig has been forthcoming. Given that few rats live longer than 3 years in the wild, the eradication of the Brown Rat on Ailsa Craig appears to have been a complete success. Let us hope the diversity and numbers of seabirds on the island will now increase even further. My sincere thanks are due to the present Marquess of Ailsa and his late father who funded the pilot studies and helped to oversee progress of the rat eradication work. Lord David Kennedy allowed storage of bait at his farm and Mr D. G. Gray, Factor of Cassillis Estate ensured financial matters ran smoothly. Scottish Natural Heritage at Ayr part-funded the initial baiting and wholly funded the back-up. Contributions to funding were also received from the Scottish Ornithologists Club, RSPB, British Ecological Society and Pintail Design. Mark McCrindle, skipper of M.V. Glorious, took me to and from Ailsa Craig, often in atrocious sea conditions and rat baiters and bait carriers, who worked in cold, wet and windy conditions deserve special thanks for their efforts in 1991 and 1992. They are: Andy Wilson (both years), Janet MacGregor, Alison MacGregor, Calley Perks, Andrew Loretto, Shona Quinn, Steve Terry, Thomas Daniels, Alistair Young, John Conner, Joe Conner and Donald and Annie Smith. From Rentokil Ltd. – G Houston and J Clarke joined the SNH volunteers and G. Hancock for a day’s hard work ashore. Both bait and people were transported and air-dropped onto Ailsa Craig by Lt. Commander David Duthie and his Sea King (819 Squadron) crew from Search and Rescue at HMS Gannet, Prestwick in 1991 and 1992. They made the unthinkable task of getting bait on top of a 1100 ft high island not only possible but enjoyable and memorable. Last but by no means least I am indebted to Professor Patricia Monaghan who first put the notion into my head that it could indeed be done. In 2002 a few pairs of Puffins returned to breed successfully on Ailsa Craig for the first time in many decades. The colony is increasing gradually to 10 pairs in 2004. Parliamentary Debates (House of Commons) 173 (5th Series) : 1194-1195. London. On the appearance of the Brown Rat (Mus decumanus, Pallas) on Ailsa Craig. Anns. Scot. Nat. Hist.132 – 134. The Handbook of British Mammals. (2nd Edition) Blackwell Scientific Publications, Oxford. The Birds of the West of Scotland, including the Outer Hebrides. Glasgow. The History and Natural History of Ailsa Craig. Paisley. The History and Natural History of Ailsa Craig. (2nd Edition) Paisley. The Birds of the Firth of Clyde. London, Witherby. Brown Rats. London, Sunday Times Publications. (Animals of Britain, No 16). Bird Notes and News. 11(2) 27-28. Bird Notes and News. 11(5) 99-100. Bird Notes and News. 11(8) 150. Seasonal variation in the numbers and condition of Gannets Sula bassana dying on Ailsa Craig. Bird Study. 30(2). 102-108. The Flora of Ailsa Craig. Glasgow Naturalist. 22(4). 307 – 344. First breeding records of Shelduck & Black Guillemot on Ailsa Craig. Glasgow Naturalist. 22(2) 197-198. This entry was posted in Articles on 15-Jan-2001 .